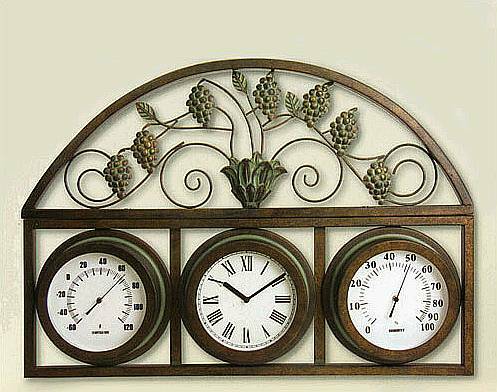 Bring a touch of elegance to any outdoor or indoor living area with this wall mounted Grapevine Design Temperature Gauge with Clock by DuroCraft. This charming piece works beautifully on a closed patio or an open deck. The Grapevine Temperature Gauge & Clock is constructed of Cast Aluminum and measures 20 Inches High and 28.5 Inches Wide. The faces of the thermometer and hygrometer feature easy to read Arabic numerals, and the face of the clock features easy to read Roman numerals. Comes with a 2 year warranty on mechanisms and a 1 year warranty on the finish. Runs on 1 "AA" battery.